Where should you grasp all sharp instruments? To maximize the striking force when using a hammer the user should hold the hammer on the . For which task is it necessary to wear gloves? A screwdriver is a tool that can be used as a wheel and axle. It has a handle to hold and turn. The handle attaches to a long shaft that ends in a flat or pointed tip. Which part of the screwdriver is the axle? A faucet handle is an example of a . The wheelbarrow is a machine that has a lever. Marcus is using a wheelbarrow to move rocks. Marcus places the rocks in the tub of the wheelbarrow. 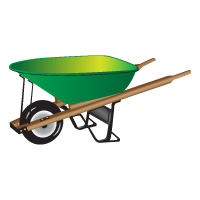 He then lifts the handles and pushes the wheelbarrow so it rolls on its wheel. This type of handle is used where the handles are more likely to be used by a person with a disability. is the curved end of the stick. The air conditioner is too cold. Can you the temperature? Make it warmer. Which of the following is not a common piece of adaptive equipment prescribed for hip or knee replacement surgery patients? What is the coordinated motion of the arms and wrists that keeps the ball secure in the pocket and ready to be passed or shot when running? Please grab the suitcase by the . Grace turns the handle of a pencil sharpener. Which part of a wheel and axle is the handle of the pencil sharpener?